Craving chocolate? This classic chocolate chia seed pudding is a healthy way to satisfy your chocolate craving! 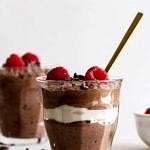 In a medium sized mixing bowl, combine the milk, chia seeds, cocoa powder, maple syrup, vanilla and salt, whisk until blended. Be patient, it will take a good minute or so to blend in the cocoa powder. Cover and place in the fridge to chill. Give a good stir after 30 minutes (this step is very important or you’re pudding will not set properly and you’ll have a soupy mixture), cover again and continue to chill. Stir again after 15 to 30 minutes. Pudding should be thickened and ready to serve within 4 hours, and will be at it thickest after 8 – 10 hours. Serve as is, or with a few of the following…. As suggested by a reader, try adding a 1/2 – 1 teaspoon cinnamon!